One of the most stressful parts of being an occupational therapy student is the level II fieldwork. A Level II is designed for you, the OT student to learn as much as you can clinically. The level II will allow you to take your textbook knowledge and apply it clinically. Occupational therapy students will tend to look at these level II fieldwork as a battle to survive. With that perspective here are 5 tips to crush your up and coming level II. When designing a treatment plan for a patient, keep it simple. As an occupational therapy student, we want to treat every aspect of the patient's problem list but this will only get you in trouble. Most students look at the general appearance and not the detail of a patients problem list. Keep the activities simple and focused as the barrier at hand. As an example ADL activities such has dressing can be simple. Come up with an activity analysis of each component. Getting dressed as an extremely complex activity but working on buttoning, zipping, and tying can components of the larger activity that might be the barrier to the larger activity. As an occupational therapy student you don’t know everything, nor does your clinical supervisor. Its completely okay to admit you are unsure or don’t know how to respond. Depending on your fieldwork setting, the unknown is part of the treatment; this is what makes us masters of evaluations and assessments. This is where evidence based practice, textbook knowledge, and clinical reasoning all comes together making our profession “an art and a science”. Additionally, as an occupational therapy student, learning and growing during your fieldwork placement is what’s going to allow you to grow as a professional and a student at the same time. This is the beginning of your interdisciplinary future within the allied health profession. This is the glory of occupational therapy, we always have several activities up your sleeve. Regardless of the placement setting, having treatment activity ideas will help you not only with the patient you are treating at that moment, but also other patients/clients you might be treating in the future. A good idea is to talk with your fellow classmates on the therapeutic activities and interventions they are experiencing during their fieldwork. This will allow you to think of the devices and equipment at your placement setting that can be adapted for the population you're working with. The worst thing to do is walk into your fieldwork not fully prepared. It's expected that a level II occupational therapy student should have the basic textbook knowledge of different diagnosis and treatments for the particular setting of their fieldwork. Refreshing and review material prior to the start of your next level II. This will allow you to feel a little comfortable during the first few nerve-racking days of your level II. Besides, you never know when you might have a knowledge inventory given to you. Similar to point 2 above, having a mentor or someone you can ask for help is critical to growing as an occupational therapy student. Sometimes your mentor might be someone at your current level II fieldwork site, from previous sites, a professor or even someone you've met during your path before or during OT school. Regardless of who your mentor is, or where you met them, take advantage of their knowledge and ask questions. This will help you get through the difficult times during your level II fieldwork. 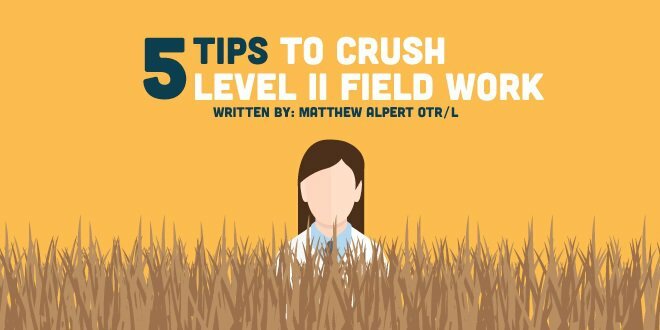 Now its time to crush your next level II fieldwork! Make sure to check back for placement specific tips and tricks.